SCVHistory.com FF5501 | Tataviam Culture | Siblings Eleanor, Ernestine & Geraldine Romero, Pacoima ~1955. Siblings Eleanor Marie Romero (March 14, 1946 - Feb. 28, 2009), Ernestine Louise Romero (later Casarez) (Oct. 23, 1949 - Dec. 4, 2009) and Geraldine Lee "Jeri" Romero (later Perez) (b. 1951), Pacoima, circa 1955. 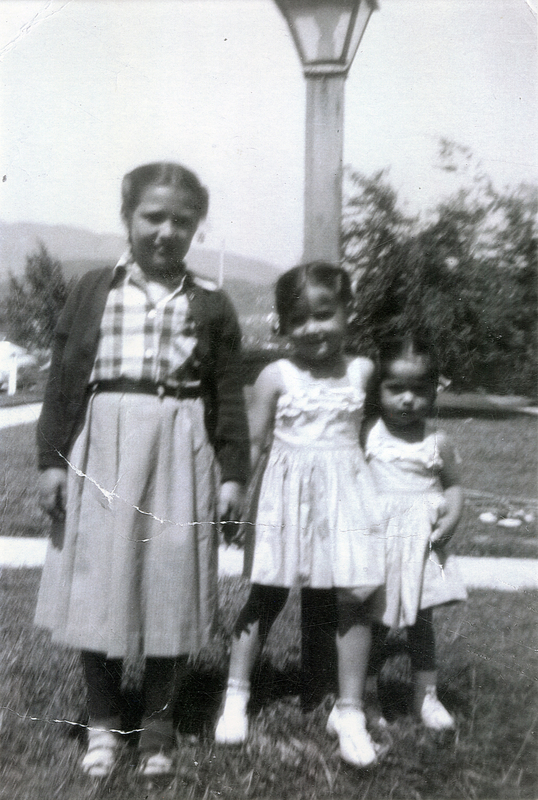 Eleanor, Ernestine and Geraldine are children of Mary Louise Garcia (1928-1999) and Harold E. "Sonny" Romero. FF5501: 9600 dpi jpeg from smaller jpeg courtesy of Geraldine Romero Perez.